Commissioned Robert Florian artwork of mussel shells and driftwood greets guests at the entryway and sets the stage for this elegant coastal-style home. Designed to reflect the homeowners’ East Coast roots, we incorporated classic white boarding on the ceilings and feature walls, which we grounded with dark rustic floors. Accents of light blue are reflected in the cabinetry and furniture and highlight the sky and ocean views. Such a timeless and classic home wouldn’t be complete without a library, a secret bookcase-door and both children’s and parent’s media rooms. 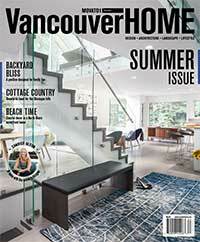 This unique and warm family home is featured in Vancouver Home Magazine. “Working with Janet has been an absolute pleasure! She understood us and our likes and dislikes and put everything together into a look that feels so much like home. Being able to pick from two or three great choices, rather than hundreds of scattered choices is such a relief! Her personal touches are exactly what we would have chosen. We are proud to show off our home and cottage and have received innumerable compliments thanks to Janet’s wonderful work!